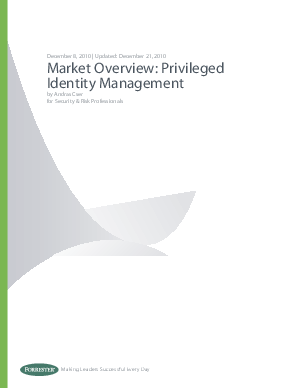 Privileged identity management (PIM) is composed of password safes, sensitive entitlement management, and session recording and auditing. It’s used primarily for managing system administrator activity in highly sensitive environments, such as production databases, domain controllers, and network infrastructure equipment. In the past, controlling distribution of passwords to these environments was enough, but today, auditors have started to pay much closer attention to what administrators actually do in these environments. Auditors now want to monitor, record, and control administrator actions to the finest level of detail possible. This has forced many changes in PIM architecture. Vendors must now provide more robust features and capabilities in their product stack, such as secure channels, provisioning integration, credentials distribution, sensitive entitlement enforcement, session recording, and auditing. To support risk models in IT administration, Forrester expects that PIM architectures will evolve in the future to encapsulate fraud management and pattern recognition.